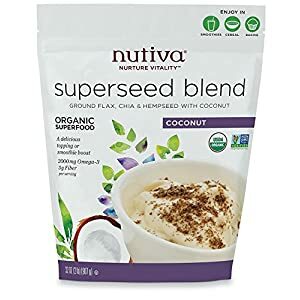 NUTRIENT DENSE: Nutiva Organic Superseed Blend is a sustainable source of Omega-6 and Omega-3 linoleic acids, immune-boosting lauric acid, clean protein, fiber, and minerals. NATURALLY PROCESSED: Nutiva’s all-natural shelling and blending process yields a clean, plant-based nutty flavored seed blend that’s easy to incorporate in everyday eating. PREMIUM DIET COMPATIBILITY: Nutiva Superseed Blend is just right for vegetarian, vegan, and gluten-free diets.